The epidermis is, of course, the largest expanse of squamous epithelium, and is often involved in disease states. 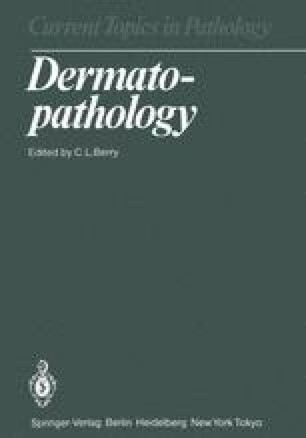 There is now good evidence that changes in cell proliferation accompany several well-recognised skin diseases, and the term ‘proliferative skin disease’ is now well-ingrained in the dermatological literature; despite this, as yet the clinical impact of studies in epidermal cell proliferation has been muted, and this is probably related to the fact that, looked at critically, our knowledge of the kinetic organisation of the human epidermis, and of its changes in disease is, even at this stage of the game, rather poor, notwithstanding the clear-cut clinical fact that drugs which are effective in psoriasis uniformly depend on interference with cell proliferation; unlike cancer chemotherapy, which field is littered with premature attempts at kinetic optimisation of therapeutic schedules, with one notable exception (Weinstein et al. 1971) there has been no real attempt to effect this in proliferative skin disease (Wright and Camplejohn 1983).